A California couple who survived every parent’s worst nightmare — in April, they awoke to discover their two-and-a-half-year-old daughter Savannah “Savvy” had passed away in her crib from SUDC (Sudden Unexplained Death in Children) — have honored her memory by giving another little girl a gift of $100,000. Savannah’s parents Larry and Carrie Carroll (who, at the time, were 8-and-a-half months pregnant with their third child) raised the money through the campaign Savannah’s Stolen Moment, which they launched on the online fundraising site Fundly. “When Savvy was alive, we made a point to create spontaneous memories with her — a surprise cookie, a trip to the playground — and we’d refer to these experiences as ‘Stolen Moments,’” Carroll, a writer, tells Yahoo Parenting. “We wanted to find a girl who resembled Savannah and give her a ‘Stolen Moment.’” The Carrolls determined that $10,000 would pay for a “Stolen Moment” of the girl’s choice (“It could be a trip to Paris or a expensive birthday party — whatever she wants,” says Larry) and the remaining amount would be directed toward her college education fund. The Carrolls didn’t have a destination in mind — they planned to hop on a plane to “somewhere” in the country, sit in cafes, parks, or the zoo, and observe parents with their little girls. Their only goal was to find a loving family who doesn’t have the funds to provide the experience. After seven months of fundraising, the Carrolls acquired more than $96,000 and on Sunday, they, along with their 6-year-old son Jack and 6-month-old son Dash, boarded a plane to Savannah, Georgia to find a lucky family. “We chose Savannah because it was not only the name of our daughter, it’s somewhere I had always wanted to take her,” says Larry. On Monday morning, the family woke up and visited parks, restaurants, and museums searching for the right family. “Along the way, we kept seeing signs that said, ‘I love Savannah,” and it felt like Savvy was with us,” says Larry. 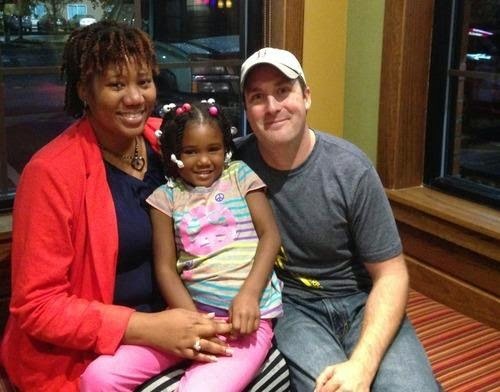 On Monday night, the two families celebrated with dinner at Applebee’s. As for Isabella’s “Stolen Moment,” it will be “somewhere with water” so Williams and her family will plan a trip to a tropical island in the upcoming months.